STOP! 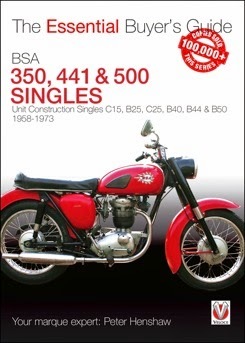 Don’t buy a BSA 350 or 500 single until you’ve first bought this book! advice on paperwork, auctions and restorations, and more. The BSA unit singles – 250, 350, 441 and finally 500cc – may not have been the most glamorous product of the British motorcycle industry, but they were the 'first bikes' for thousands of learner riders and had a great track record in scrambling and motocross. Today, they offer a simple and affordable entry into the world of British classic machines, with a whole range of sizes. Spares are still available, as is friendly and knowledgeable fellow owners. Following the tried-and-tested Veloce Essential Buyer’s Guide format, this book delves into what it’s like to live with one of these bikes, and the values, advantages and disadvantages of the different models. Plus, of course, what you need to look for when buying one – the engine, transmission, frame, brakes, suspension, paint, chrome … and everything else! A unique buying guide to one of the definitive British four-stroke singles of the 1960s. Full of first-hand information and advice on every aspect of these British classics.